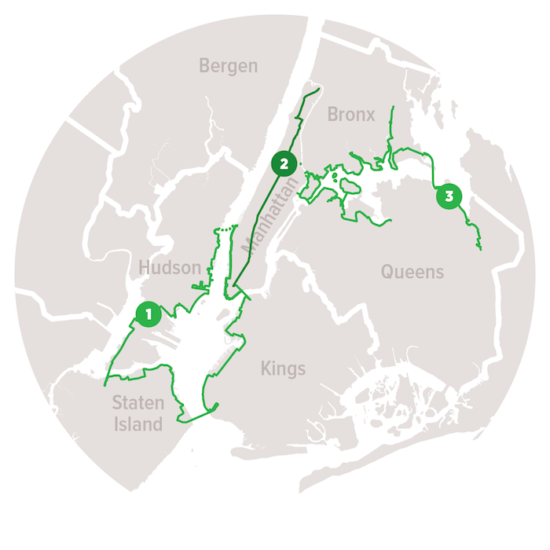 Last week the Regional Plan Association (RPA) released a report proposing the creation of a 1,650-mile trail system linking Manhattan to the outer boroughs and tri-state area. The report, Accessing Nature, is part of RPA’s Fourth Regional Plan, which is slated for release later this fall. 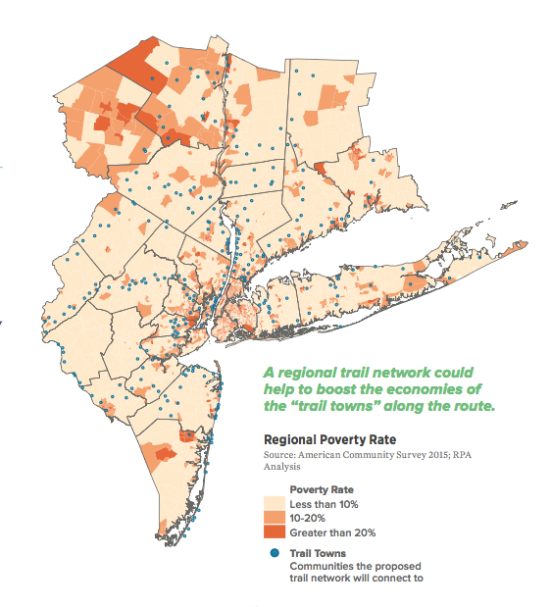 If the entire plan came to fruition, New York, New Jersey, and Connecticut residents would be able to hike and bike a combined distance equal to that between New York and Colorado. 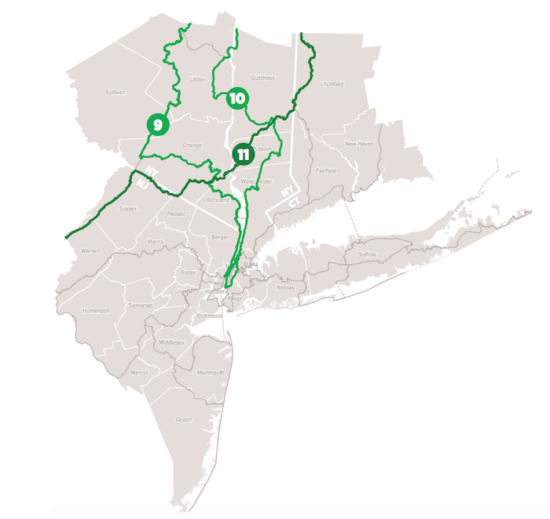 The plan links new trails to existing ones and puts over 80 percent of the region’s residents within two miles of a trail while unifying the tri-state area’s existing natural resources into a contiguous network. 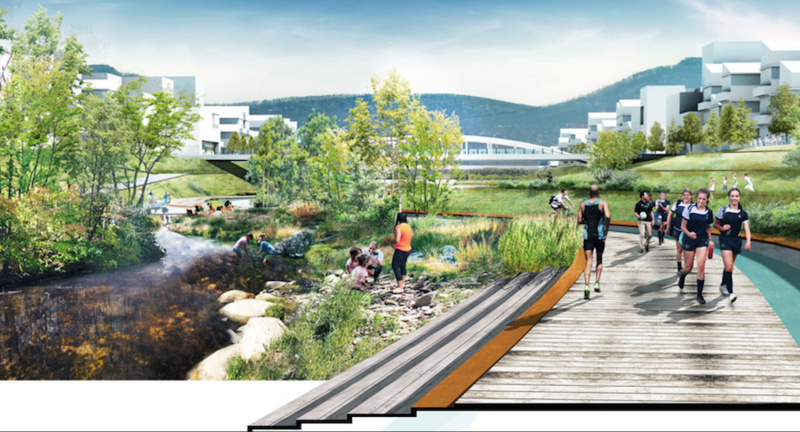 By connecting regional rail lines to trail networks, knitting together 141 parks, and transforming underused energy corridors (like power line route) into pathways, RPA hopes to encourage outdoor recreation and economic growth in adjacent communities. The plan targets almost 300 municipalities that would become “trail towns” connected to a whole system. RPA hopes that the developing infrastructure could support tourism and hospitality industries in smaller locales. Equitable access to trail systems and outdoor resources has also been proven to promote physical and mental health, creating opportunity for nearby residents to be active. Partnerships with local stewards and organizations will be integral to realizing the plan. At its Urban Core scale, the proposal includes 111 miles of trails within New York City limits alone, including an entire ring around the city harbor linking Jersey City to Staten Island to Brooklyn, then up along Lower Manhattan. A north-bound trail running directly up Broadway (aiming for the eventual total pedestrianization of the street) would connect Upper Manhattan to the waterfronts in Queens and the Bronx—part of which would only be possible if Rikers Island was closed and consolidated. The proposed trailways in New Jersey come out to a 417-mile system, still largely incomplete. The trail system would extend westward from New York down the Morris Canal into Lehigh Valley, wrap around the D&R Canal, and branch out to cover the entire length of Jersey Shore at the high-water mark. At almost 600 miles, the Mid-Hudson circuit is the largest part of the plan, but also the section with the most existing trail infrastructure. Large swaths of this connector provide sweeping views of the Hudson Valley, connecting existing pathways all the way up to Albany. Ideally, this would create a direct route for New York City residents to upper valley trails (and westward to the Erie Canal), as well as bridging directly into the Appalachian Trail. The Connecticut extension, at 170 miles, rounds up a 1994 RPA proposal for a greenway along Merritt Parkway and the East Coast Greenway, stringing together near-coastal cities of the Long Island Sound to inner-state agricultural landscapes and smaller towns (the Parkway, which is gorgeous, was listed on the National Register of Historic Places in 1991). Another connector links the East Coast Greenway to the Appalachian Trail to the north. The proposal for Long Island stretches out at 318 miles, repurposing the former Long Island Motor Parkway as a trail spanning the entire length of the island from the New York Harbor to Montauk. Coastal trails bridge out to the Long Island Greenbelt on the Sound side and to the Long Island Seashore Trail on the coastal side from Jones Beach to Fire Island. The RPA and its partners are currently moving forward on fundraising and implementation, which will require a long-term commitment to trail maintenance – no small task for such an extensive system.